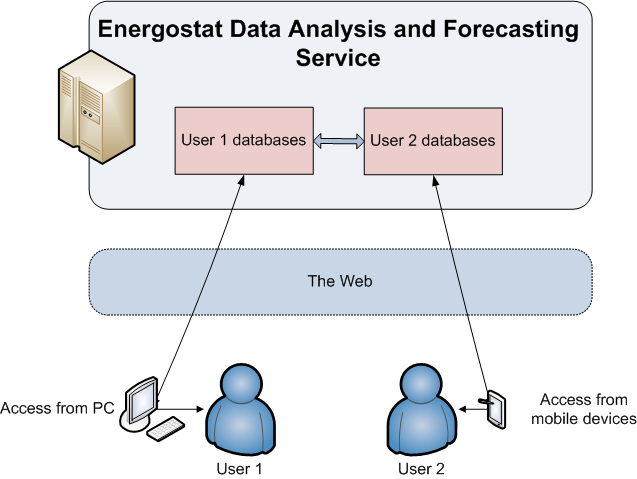 The Energostat Data Analysis and Forecasting Service provides tools for the analysis and forecasting of power consumption and other performance indicators implemented as a cloud service accessible for the user community. Quick access to suitable forecasting tools provided to various enterprises (utility, grid and generating companies, their branches and large consumers). The functionality of the Forecasting Service can be used by any enterprise operating in the electric power industry and other branches of the industry, where the monitoring of parameters over the course of the day is required alongside with the statistical analysis and forecasting functions. General-purpose software for processing daily shapes can be applied to a broad class of parameters plotted at a resolution of 1 hour and 30 min. For long-term planning tasks, data processing tools of monthly, quarterly and yearly resolution are available. Indices of meteorological factor effects on power consumption and other parameters. The analysis may be both general for a time series and for hours of the daily shapes. The tables of statistical estimate results and plots of statistical factors, correlation and autocorrelation function curves may be printed and exported to MS Excel. At this time Analysis and Forecasting Service is available only by request to info@energostat.ru.